This is NOT a fixed or savings deposit. It is an endowment insurance plan. PrimeGold Bonus 2 is a single premium endowment insurance plan that provides you with financial protection for death and total and permanent disability (TPD) during the policy term. Also, you get to enjoy the option to choose between a 15 or 20 year policy term. You only need to pay premium once using cash or funds from your SRS in the first year to enjoy PrimeGold Bonus 2. Miss Tan is age 45 (next birthday) and a non-smoker. 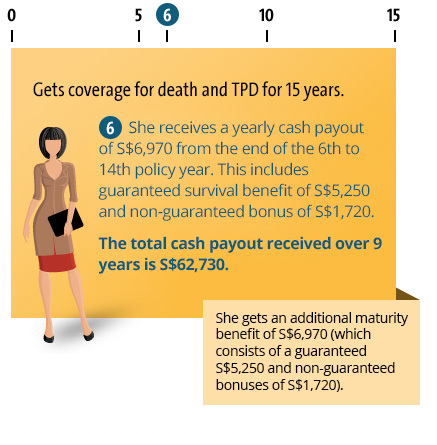 She bought PrimeGold Bonus 2 with a 15-year policy term and a basic sum assured of S$52,500. She pays a single premium of S$50,000. and she will receive her yearly cash payout from the end of 6th to 14th policy year. She will get a total policy benefit of S$69,700. This consists of the total survival benefits paid during the policy term, the maturity benefit paid at maturity and the non-guaranteed bonuses paid during the policy term. The figures used are for illustrative purposes only. Please refer to the policy illustration and product summary for the exact values. The non-guaranteed bonuses are based on an illustrated investment rate of return of the participating fund at 4.50% p.a. Based on an illustrated investment rate of return at 3.00% p.a., the total policy benefit will be S$60,450. The actual benefits payable will vary accordingly to the future performance of the participating fund. Please refer to the policy illustration and product summary for more information. PrimeGold Bonus 2 is provided by The Great Eastern Life Assurance Company Limited, a wholly owned subsidiary of Great Eastern Holdings Limited and a member of the OCBC Group. This plan is not a bank deposit and OCBC Bank does not guarantee or have any obligations in connection with it. Want to know more about PrimeGold Bonus 2?